Sired by St Simon out of Perdita II, bred at the Sandringham Stud, owned by the Prince of Wales (the future Edward VII) and trained by Richard Marsh, Persimmon was one of the most celebrated racehorses of the late-Victoria era. 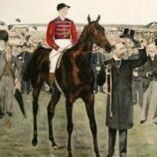 Described as having 'a bold head, perfect shoulder and wonderful power behind the saddle', his greatest win was the 1896 Derby when, ridden by Jack Watts, he set a course record of 2 minutes 42 seconds, beating his great rival St. Frusquin by a neck. The close finish and the royal connection made it a hugely popular victory, and consequently Robert Paul's short film of the finish of the race became a triumph. Birt Acres had filmed the unremarkable 1895 Derby for Paul, but Paul's feat of getting his film of 3 June 1896 onto the screen at London's Alhambra and Canterbury music halls within twenty-four hours of the race's finish caused amazement and was a tremendous advertisement for the new medium. People stood and cheered the film, demanding that it be shown again and again, and calling out 'God bless the Prince of Wales'. Although film of news events had already been taken, notably the coronation of Tsar Nikolas II the previous month, Paul's Derby film qualifies as the first ever true newsfilm for having been brought to the screen while it was still hot news, initiating a tradition for speedy newsreel work that was to flourish in Britain in particular. Paul proceeded to film the Derby from the same, rather poor camera position (just after the finishing post) for the next few years, leading to much confusion in later years between the 1896 film and other, similar, records. The Prince of Wales was to win the Derby again in 1900 with Persimmon's true brother Diamond Jubilee, but nothing could match the extraordinary scenes of enthusiasm and delight that followed the most famous Derby of them all. Persimmon sired Zifandel, winner of the Ascot Gold Cup, Your Majesty, winner of the St Leger, and Sceptre, winner of four British classic races in a single year (1902). Persimmon died in 1908, and his skeleton was put on display at the Natural History Museum.